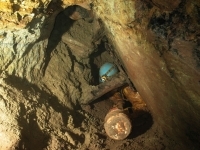 The origins of the Cobalt Mine are believed to have been in the early 19th century. The mine was apparently forgotten by the miners in the late 19th century as it is not shown on their abandonment plan but as cobalt has been found in the veins in the mine, and cobalt was apparently unknown at Alderley Edge before about 1808, we believe that this mine dates from the work by the Company of men from Stockport between 1804 - 1810. Exploration at several points on the Edge suggests that the cobalt is concentrated on a north-south series of faults as similar ores are found at Saddlebole, the Cobalt Mine, crossing the Macclesfield Road near Bradford Lane and in Finlow Wood. In 1811, the findings were rare and interesting enough to be described in magazines such as the Gentleman's Magazine where an article by R Bakewell can be found. The life of the cobalt working was however short as mainland European sources soon became available again after the end of the Napoleonic war. By the 1850s, one of the shafts had been covered by a building and the mine appears to have been forgotten. At the end of its life, one section of the Cobalt Mine found a new use as a water source for the Wizard. Water was pumped from a shaft that drops through the hanging wall, across the vein and into the footwall of the mine. The well is still marked by a pump wheel and some of the pumping apparatus is still present underground. The DCC first entered the mine by dropping down the well and through a narrow connection into the main working. Initially, we called it the Wizard's Well Mine but it soon got the name of Cobalt Mine when the mineralisation was found to be cobaltian. 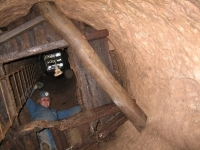 There are currently four entrances to the Cobalt Mine: (1) a shaft at the north end of the Wizard Restaurant car park, (2) the old well adjacent to the car park, (3) the shaft inside the mining museum (known as Tom's Shaft) and (4) a shaft in trees south of the Wizard Restaurant known as Holly Shaft. All four are connected underground by a compact mine formed on a N-S fault at several shallow levels. There are signs of there having been several shaft entrances at 10-20m intervals. The mine forms part of a series of unconnected shallow workings from Saddlebole in the north to Finlow Wood in the south, all believed to have been worked for cobalt in the early 19th century. The known length of the mine is about 300 metres and the maximum depth below surface is 20 metres. 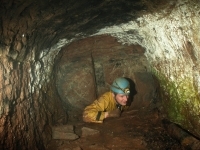 The mine is entered today via Tom's Shaft or Holly Shaft, both dug open by the Derbyshire Caving Club. Access to the mine is not generally open to the public but visitors to the museum can look down Tom's Shaft which has lights installed. Go to the main photo gallery for more pictures of The Cobalt Mine.